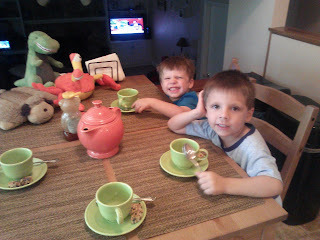 Tonight I had a mommy moment I never thought I would have as a mother of two boys, a tea party. Yes to my surprise at breakfast this morning Jude smiled and softly asked me, "mommy can we have a tea party." Well we had a lot to do this morning with swimming lessons and a few must run errands. But not wanting to damper his fun and imagination, I said that after nap and dinner we would throw a grand tea party! So then of course we had to make our plans. Who would we invite? What would we serve? So we started on the guest list. Jude decided that of course all the family should attend. We listed mommy, daddy, Jude and Joel. Then for our friends. Jude would invite his new friend dinosaur, Joel his friend crabby and dream light dog. Now for the menu.Tea of course, but what kind? We decided on a nice peach passion tea with honey and milk. As for tasty treats, nothing to fancy. Chocolate chip and peanut butter granola bars cut of course finger size! So after nap and dinner, party time was upon us. The table was set. The guest had arrived. Time for tea. Everyone had real tea cups and saucers. Joel was impressed! We ate. We talked. I learned that even boys can appreciate a good old fashion tea party. What a nice little memory!